Twenty years ago, the search for planets outside the Solar System was a job restricted to science-fiction writers. Now it's one of the fastest-growing fields in astronomy with thousands of exoplanets discovered to date, and the number is rising fast. These new-found worlds are more alien than anything in fiction. Planets larger than Jupiter with years lasting a week; others with two suns lighting their skies, or with no sun at all. Planets with diamond mantles supporting oceans of tar; possible Earth-sized worlds with split hemispheres of perpetual day and night; waterworlds drowning under global oceans and volcanic lava planets awash with seas of magma. The discovery of this diversity is just the beginning. There is a whole galaxy of possibilities. The Planet Factory tells the story of these exoplanets. Each planetary system is different, but in the beginning most if not all young stars are circled by clouds of dust, specks that come together in a violent building project that can form colossal worlds hundreds of times the size of the Earth. The changing orbits of young planets risk dooming any life evolving on neighbouring worlds or, alternatively, can deliver the key ingredients needed to seed its beginnings. Planet formation is one of the greatest construction schemes in the Universe, and it occurred around nearly every star you see. 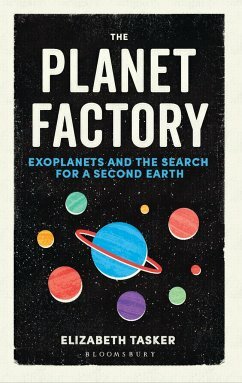 Each results in an alien landscape, but is it possible that one of these could be like our own home world? Elizabeth Tasker is an astrophysicist specialising in computational models of how stars and planets form in our galaxy. After a degree in theoretical physics, she went on to complete her doctorate at Oxford before moving across to the United States and Canada for postdoctoral research positions. In 2011 she became an assistant professor at Hokkaido University in the north of Japan, and moved to the Japanese Aerospace Exploration Agency (JAXA) as an associate professor in 2016. Elizabeth has been a keen science communicator for many years, dating back to winning the Daily Telegraph Young Science Writers Award in 1999. Since then she has written for Scientific American and Astronomy Magazine, as well as blogs on sites that include Nautilus, the Conversation and space.com.